Had 2 of these drop from Ironbelly, a named polar bear, in the pit in Valdeholm, last night. So it appears that you loot a large <blank> powersouce and a <blank> mold from a raid encounter and turn them into terraxs in C.R. to recieve your new armor. Does anyone have a link of the finished items yet? The large powersources are for the TSS raid armors from Terraxs in Crescent Reach. They have nothing to do with the TSS group armors from Tenish. I tried to turn this in with my tier 2 Bp and tenish handed it back to me telling he had no need for it. 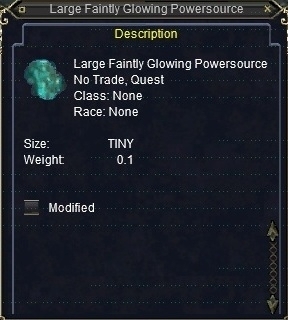 So you might need this and a new BP mold from a raid mob or a new quest from tenish. I tried everything i could think of saying to tenish to try and get a tier 3 quest but i was not able to get one. If anyone figures it out please post. Has anyone figured out how this is used yet? By the name i am asuming that it has something to to dwith the tier armor released with the TSS expansion. I have quested the tier 2 shaman BP and have 2 of these powersources in my bank. I've been to both Tenish and Terrack in Cresent Reach to try to find a quest that involved this item but have been unable to find anything. If anyone has any info on how to use this please post. As far as i know i didn't miss any text doing the quest for tier 1 and tier 2 that mentioned this. Dropped for us off of Lorekeeper Heimdul in Frostcyrpt. Just dropped for us off Rallosian Acolyte Aemon in Frostcrypt.